The Distinguished Leadership in Disability Policy Award was awarded to the Honorable Barbara Mikulski, pictured here with The Arc's CEO Peter Berns and SABE's Betty Williams. The 2011 Disability Policy Seminar (DPS) – Cultivating New Champions on Capitol Hill – educated and empowered attendees to fight for our issues on Capitol Hill in mid-February. 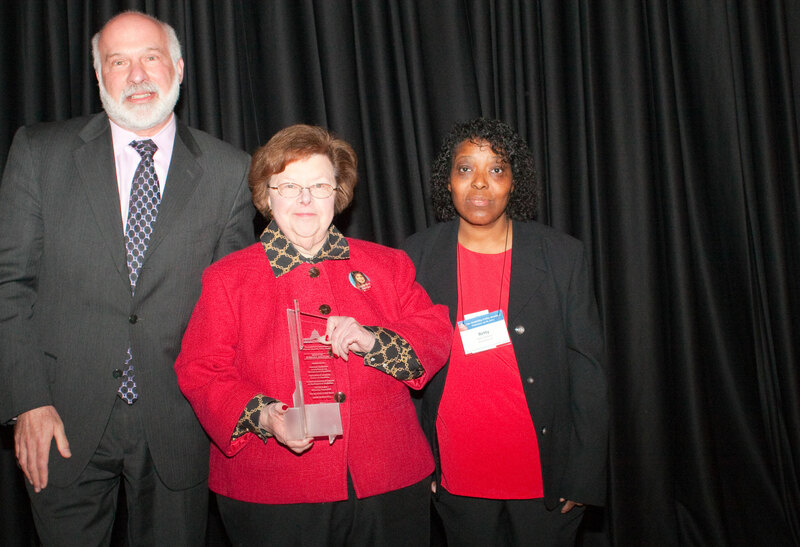 Attendees were emboldened and inspired at the gathering, especially with the awarding of the Distinguished Leadership in Disability Policy Award to the Honorable Barbara Mikulski (D-MD), United States Senate. The award was presented to Sen. Mikulski by Betty Williams, President, Self Advocates Becoming Empowered. Peter V. Berns, CEO of The Arc said “we are honoring Sen. Mikulski as a long-standing champion of disabilities issues and for her outstanding role in the passage of Rosa’s Law which is a great step forward in full inclusion.” Rosa’s Law is legislation that substitutes the term “intellectual disabilities” for the term “mental retardation” in many federal laws. The stakes are high this year with disability programs facing serious budgetary and political challenges. This year’s record number of participants was spurred to action in this current climate and was briefed on the ‘hot’ issues facing people with disabilities, including the Affordable Care Act, Developmental Disabilities Act, Employment, Housing, Medicaid/Medicare and more. Colleagues and friends gathered to honor and celebrate the career of Paul Marchand, who for 38 years has been one of the most ardent and successful disability policy advocates working on behalf of The Arc, United Cerebral Palsy and the entire intellectual and developmental disability community. The event kicked-off The Paul Marchand Internship Fund to support the next generation of difference-makers in the world of public policy and advocacy for the intellectual and developmental disability community. The 2011 Disability Policy Seminar was presented by The Arc, United Cerebral Palsy the American Association on Intellectual and Developmental Disabilities, the Association of University Centers on Disabilities, the National Association of Councils on Developmental Disabilities and Self Advocates Becoming Empowered. This entry was posted in Programs and Supports and tagged Disability Policy Seminar, The DPS. Bookmark the permalink.